This is the story of how Newcastle Brown Ale became the highest selling bottled beer in Britain, and came to make significant sales in the United States. Established on Bath Lane, Newcastle in 1867 by Bells, Robson & Co, the Tyne Brewery was said to be the largest in the North of England. However the business entered into financial difficulty, and it was acquired by John Barras & Co of Gateshead, after their own brewery site was purchased by the North Eastern Railway, in 1884. John Barras & Co was operated by Charles John Reed (1820 – 1908), who had leased the brewery since 1861, after marrying into the founding Barras family. A masterstroke of Reed was to appoint Thomas Watson Lovibond (1849 – 1918) as head brewer and manager from 1887. Lovibond was scientifically trained at a time when almost all brewers lacked such formal education, and he was to have a significant impact upon the future success of the business. John Barras & Co traditionally brewed mild ale, but under Lovibond’s direction, pale ale was being produced by 1889, in order to compete with rival products from Burton upon Trent and Edinburgh. Lovibond also introduced greater standardisation of product quality. John Barras & Co merged with four local brewers in 1890: W H Allison of North Shields, J J & W H Allison of Sunderland, Swinburne of Gateshead and Carr Brothers & Carr of North Shields to form Newcastle Breweries. The Tyne Brewery was regarded as one of the largest and best equipped breweries in the North of England, and all production was centralised there. As a result, the output of the brewery was doubled from 900 to 1,800 barrels a week. The amalgamation was to prove highly successful. Forster’s Bishop Middleham Breweries was acquired in 1910. James Herbert Porter (1891 – 1973) was the son of a master brewer in Burton upon Trent. He joined Newcastle Breweries as a trainee brewer in 1909. The model of an English gentleman, Porter was a highly courteous and mild-mannered man. Porter fought during the First World War, and was promoted to Lieutenant Colonel. Newcastle Exhibition, a cask beer, was introduced from 1920. After the war, sales of bottled beers began to increase, influenced by the inconsistent quality of cask beer. Colonel Porter determined to develop a high quality bottled beer of his own. Newcastle Breweries opened one of the largest and best-equipped bottling plants in Britain in June 1925. Colonel Porter, by now promoted to assistant brewer, and Archdale Mercer Jones (1881 – 1954), manager of the bottling works, laboured for three years to perfect the recipe for Newcastle Brown Ale. Porter created its distinctive taste by blending a strong aged beer with a light pale ale. Newcastle Brown Ale was launched in April 1927. The sole ingredients were malt, hops, sugar and yeast and it boasted an ABV of 6.25 percent. Originally it was filtered but was not subject to pasteurisation. Newcastle Brown Ale would have been seen as a rival to Bass Pale Ale, a comparable beer in terms of strength and quality. A similar beer, Whitbread Double Brown, had been launched in London just a month earlier. Newcastle Brown Ale enjoyed immediate success. It was a quality product brewed to vigorous scientific methods and high standards, and sold at a reasonable price. Perhaps as a result, Colonel Porter had been promoted to head brewer by September 1927. 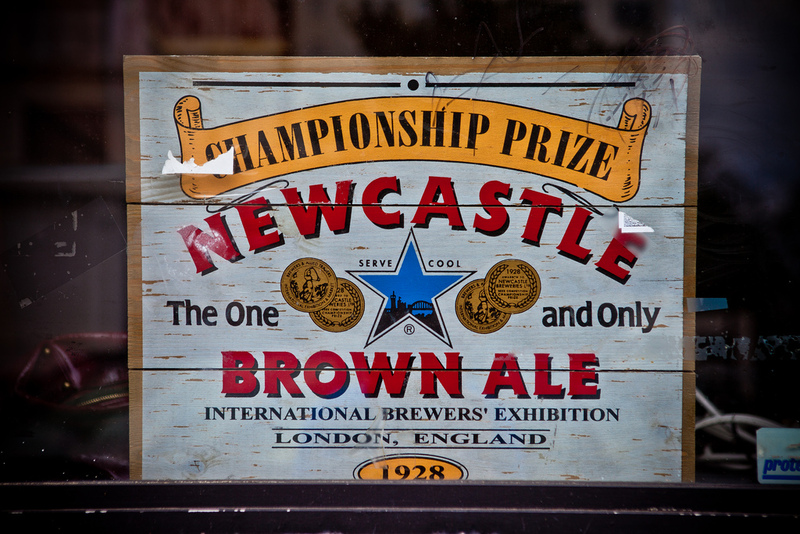 Newcastle Brown Ale was named as the best bottled beer in Britain at the 1928 Brewers Exhibition in London. The blue star logo was introduced in 1928. Each point on the star represented one of the five businesses that combined to form Newcastle Breweries. Newcastle Brown Ale ABV had been reduced to around 5.5 percent by 1931. Colonel Porter was promoted to the Newcastle Breweries board of directors in 1931. During the Second World War Newcastle Breweries encountered material shortages, and as a result brewed lower strength beers out of necessity. 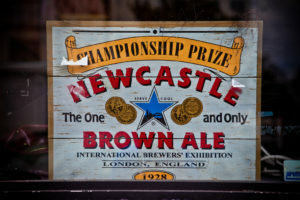 However the company refused to compromise the quality of Newcastle Brown Ale, which went unchanged, although by necessity production represented just a small fraction of demand. Although sales remained confined to the North East of England, 300 million bottles had been produced by 1952. Colonel Porter was appointed chairman of Newcastle Breweries in 1955. The Tyne Brewery occupied 6.5 acres by 1956. Production of Newcastle Brown Ale had continued to grow and the brewer’s bottling facility had reached capacity. A new bottling plant entered into production from 1959. John Rowell & Son of Gateshead was acquired in 1959 to bring the total number of Newcastle Breweries controlled premises to around 700. Newcastle Breweries merged with Scottish Brewers to form Scottish & Newcastle in 1960. Colonel Porter was appointed vice chairman. Newcastle Brown Ale was a leading product of the new company, alongside McEwan’s Export and Younger’s Tartan Special. The merger afforded Newcastle Brown Ale a wider network for distribution. 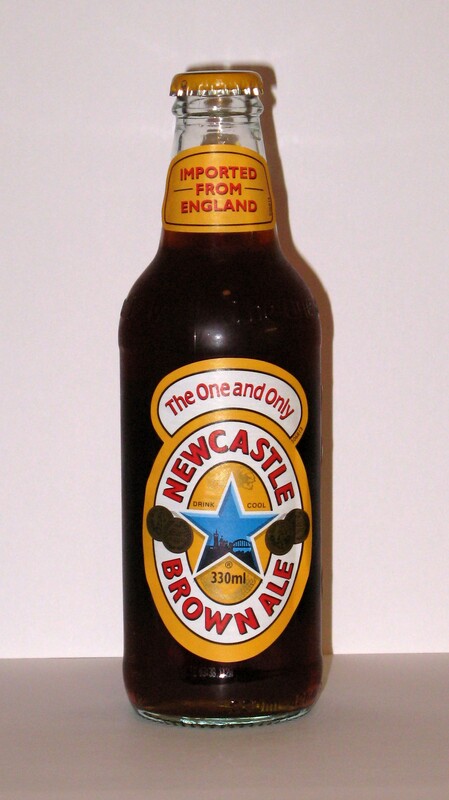 In the early 1960s Scottish & Newcastle began to produce Newcastle Brown Ale in brown bottles instead of clear ones. This was to protect the beer from UV rays, which can have a negative impact on taste. However drinkers complained about the change, and the decision was swiftly reversed. Distribution of Newcastle Brown Ale throughout the Midlands and the South of England had begun by the late 1960s. The Tyne Brewery was producing over one million barrels of beer a year by 1972, however increased national sales of Newcastle Brown Ale saw the facility struggle to meet demand. Domestic sales of Newcastle Brown Ale peaked in 1974, after which sales of bottled beers began to enter into a steady decline. The appeal of bottled beer had been its consistency, but with the increasing quality and distribution of keg beer, its unique selling point was lost. By 1977 a total of 7.5 million barrels of Newcastle Brown Ale had been produced since it was introduced in 1927. Newcastle Brown Ale was the highest selling packaged ale in Britain by 1980. It was sold in over 97 percent of off licences in England and Wales and more than 90 percent of supermarkets and grocers. It is believed that Newcastle Brown Ale ceased to be a blended beer from the early 1980s onwards. A new £3 million bottling plant was opened in 1984. The Tyne Brewery had grown to cover 14 acres by 1985. 1,200 people were employed there in 1988. Scottish & Newcastle was the fifth largest brewer in Britain by 1988. Newcastle Brown Ale was being packaged in cans, as well as bottles, by 1988. Newcastle Exhibition was the highest selling draught ale in the North East of England by 1989. 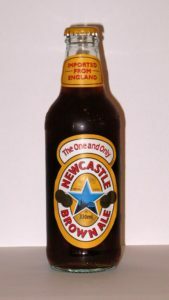 Newcastle Brown Ale underwent a resurgence in the late 1980s and early 1990s with increased distribution in the South of England, as well as a strong presence in student union bars. Marketing efforts dissociated the drink from its working class roots in an attempt to position it as a premium product. Scottish & Newcastle took direct control of its United States product distribution from 1990 onwards. With American headquarters in San Francisco, by the mid-1990s the brand had gained significant traction in the United States. Newcastle Brown Ale was a pasteurised beer by 1994. The pasteurisation process increases the shelf life of the product, but critics contend that it reduces the delicate aromas of beer. The brewery borehole water source lacked sufficient purity by 1995, and purified water from reservoirs was instead used, to which Scottish & Newcastle added gypsum and epsom before brewing. Scottish & Newcastle acquired Courage in 1995 to become the largest brewer in Britain. 230,000 hectolitres (140,000 UK barrels) of Newcastle Brown Ale were exported to the United States in 1998. The majority of Newcastle Brown Ale production was shipped to the United States by 2001. The Tyne Brewery was closed in May 2005. Production of Newcastle Brown Ale was relocated to the Federation Brewery in nearby Dunston, Gateshead. Newcastle Brown Ale was among the top fifty highest-selling beers in the United States by 2006. Bottling of Newcastle Brown Ale was relocated to the John Smith’s Brewery in Tadcaster, North Yorkshire, from 2007. Scottish & Newcastle was acquired by Heineken, a Dutch brewer, in 2008. Heineken closed the Federation Brewery in May 2010, and Newcastle Brown Ale production was relocated to the John Smith’s Brewery. Caramel colouring, apparently used to darken and flavour Newcastle Brown Ale since its inception, was replaced with roasted malt from 2015, amid US health concerns. Production of Newcastle Brown Ale for export was relocated to the Zoeterwoude Brewery in the Netherlands from 2017. Newcastle Brown Ale will be brewed by Heineken in the United States from 2018. The packaging lists its ingredients as malted barley, roasted malt and Centennial and Chinook hops.